For a breakfast with a little more glam and prep time try Eggs Florentine. 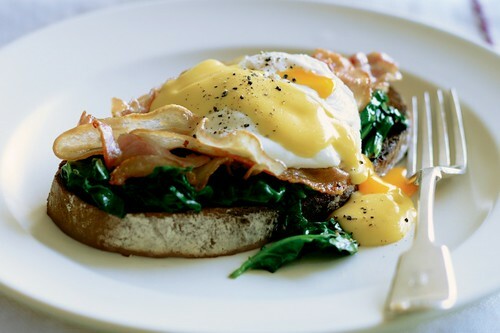 Eggs Florentine is poached eggs served on toasted sourdough bread with spinach and Hollandaise sauce. To prepare you will need 4 eggs, 1 bunch of baby spinach, 3 tsp of white vinegar, 2 thick slices of sourdough bread, butter, Hollandaise dressing, 5 black peppercorns, 1 bay leaf, 2 egg yolks,2 tsp lemon juice, 1/2 tsp of salt. Make the Hollandaise sauce by combining the vinegar, peppercorns, and bay leaf in a saucepan over low flame. Allow to simmer until the mixture reduces to 2 teaspoons. Remove from heat,strain, and set aside.Use a heatproof bowl over a medium saucepan with water. Remove the bowl from the saucepan and bring the water to the boil. As the water boils use egg yolks and vinegar and whisk until combined. When the water has boiled place the egg mixture over the saucepan and use a whisk to mix for 3 minutes until thick and has doubled in volume. Whisk the mixture and warm melted butter a few drops at a timeuntil incorporated. Mix lemon juice and add salt and pepper. To prepare the eggs put vinegar in a frying pan with water and boil over a low flame. Break 1 egg into a saucer and use a large spoon to make a small eddy in the water. Then add egg in the middle and poach for 1 or 2 minutes. When cooked transfer to a plate. Cook spinach in water and drain. Toast bread and put on a plate. Add spinach, poached eggs and drizzle with hollandaise sauce.